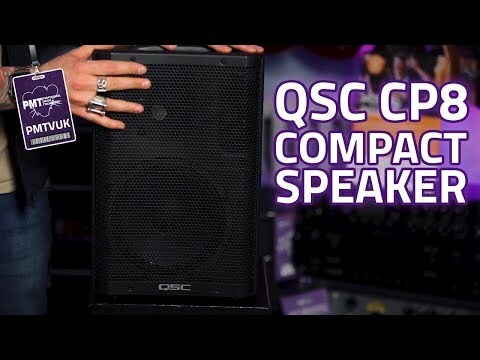 The QSC CP12 is a compact powered loudspeaker and the flagship active speaker in QSC’s fantastic Compact Powered speaker range, delivering.. The QSC CP12 is a compact powered loudspeaker and the flagship active speaker in QSC’s fantastic Compact Powered speaker range, delivering high-end performance in an incredibly compact package. 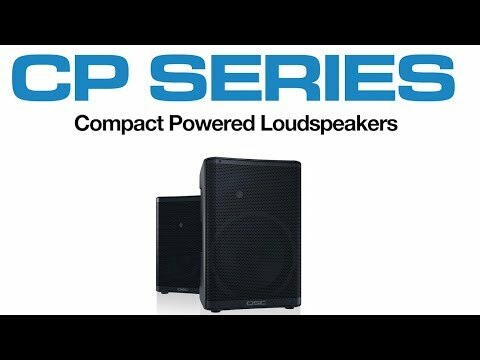 Coming in an extremely compact and lightweight cabinet, the CP12 is a 12” loudspeaker that is more similar in size to most 10” loudspeakers, giving you incredible power and great sound but with more options. Carrying on the tradition of QSC loudspeakers, the QSC CP12 active speaker boasts high performance, superior quality and amazing, lasting reliability. Equipped with a 1000-watt peak power Class D amplifier module, the QSC CP12 gives you a generous 800 W LF and 200 W HF. Powerful, great sounding low-end is produced by the 12” LF cone while pristine high end is delivered courtesy of a 1.4” compression driver HF transducer. For additional low end, you can easily connect an external subwoofer such as the QSC KS112, also available at PMT Online. A range of easy-to-use controls are on board to make sure you can get the most out of the CP12 active loudspeaker for the great results you want. Two gain controls and a mic boost push switch allow you get your levels just right while a 6-way contour selection switch allows you to set the sound of the QSC CP12 just right. Default – The standard, factory voicing of the loudspeaker for use with live music, program music, or instruments. Default Ext Sub – The standard, factory voicing of the loudspeaker with an 80 Hz high-pass filter for use with live music, program music, or instruments, and an external subwoofer (such as the QSC KS112). Dance – A voicing with low frequency enhancement and mid/high clarity more suitable for program material playback like pop or electronic music. Dance Ext Sub – A voicing with low frequency enhancement and mid/high clarity more suitable for program material playback like pop or electronic music, with an 80 Hz high-pass filter for use with an external subwoofer (like the QSC KS112). Floor Monitor – A voicing for a full, balanced sound when used as a wedge monitor, giving added stability when live microphones are nearby. Speech – A voicing (Channel B only) that gives clarity and stability when used with either a hand-held dynamic microphone or headset microphone. Incredibly compact, the QSC CP12 is surprisingly lightweight so it is easy to carry, transport and lift and it’s easy to use it in a huge range of applications from portable to more permanent installations. With the ability to mix up to three input sources, in the form of mic/line, line and music playback, the QSC CP12 is ideal for entertainers, educators and preachers. It’s pretty much an all-in-one PA system that you can easily set up in seconds. It’s also great for use in larger systems as it can be mounted on a speaker pole (with its standard 35mm pole socket), used as a floor monitor or even as an amplifier for your musical instrument. Also, with its compact and lightweight form factor, the CP12 loudspeaker can easily be attached to a wall or truss (using the separately available yoke mount). Easy to transport, easy to use and delivering great results… plus a global 3-year warranty that keeps it protected, there’s a whole lot to love about the QSC CP12. A 12” loudspeaker offering fantastic and reliable performance in a conveniently small enclosure, the QSC CP12 allows you to have a high-performing sound system where space and weight limitations would normally stop you. Buy the QSC CP12 powered loudspeaker from PMT Online now and get fantastic audio for just about any application.